Image caption "Aspects of national teleportation. Panama," popular Twitter account wrote. Many people had a childhood dream about teleportation - you enter a glimmering teleport, or say "Beam me up!" and are transported hundreds, maybe even millions of miles away. Spoof account "Yekhidnye Novosti" (Russian for "sneering news") wondered: "Teleportation is all very well. But perhaps it would make sense first to provide half of Russian population with hot running water?" Image caption "Thirty-seven million Russians live without sewerage and with toilets in their kitchen gardens. And the government will spend R10bn on teleportation," a popular spoof account tweeted, accompanying the tweet by a picture of one such typical toilet. The outdoor toilets proved to be popular among netizens as would-be teleportation devices. Image caption "By 2035, teleportation booths will appear in every Russian yard," a popular account tweeted. In another typical comment, popular user "Dyadyushka Shu" joked about money being "teleported" away from Russia: "Experiments in teleportation have been going on in Russia for a long time - billions of dollars have already been successfully teleported to Panama offshores." Others were sceptical about the proper use of the funds allocated for the project. Image caption "Russia plans to launch teleportation by 2035. 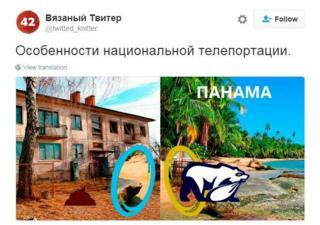 Embezzling 10bn [roubles] for this matter," satirical group Lentach tweeted. Prominent opposition leader Alexei Navalny retweeted the Kommersant report accompanying it with a photo of a somewhat bewildered-looking Prime Minister Medvedev making a balloon figure. Image caption "During 2025-35, the Russian government expects to introduce teleportation," Navalny tweeted sarcastically. Image caption "The government has become so desperate that in order to flee from Russia a whole teleporter is being built," another popular spoof account tweeted. Similarly, opposition news and commentary website Grani.ru tweeted: "We failed to build communism by 1980, so now we shall try and implement teleportation by 2035." After all the hype and giggles on social media, the agency behind the development programme published a comment, saying that the teleportation in question was actually quantum teleportation, something that has been around for a while. But did anybody listen? I think we know the answer.